Beledweyne (Somali: Beletweeyne, Arabic: بلد وين‎, Italian: Belet Uen) is a city in central Somalia. Located in the Beledweyne District, which is mainly inhabited by the Hawadle clan a subclan of the Hawiye one of the larger clans in Somalia.It is the capital of the Hiiraan province. The town is situated in the Shebelle Valley near the Ethiopia border, some 210 miles (345 km) north of Mogadishu. Beledweyne is divided by the Shebelle River into eastern and western sections. 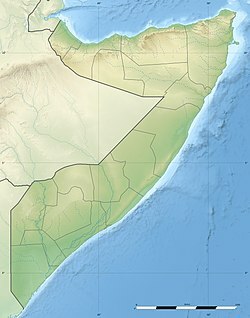 During the Middle Ages, Beledweyne and much of the surrounding area in southern Somalia was governed by the Ajuran Empire. The town later came under the administration of the Hiraab Sultanate in the late 17th century after the collapse of the powerful Ajuran Empire. At the turn of the 20th century, Beledweyne was incorporated into Italian Somaliland protectorate. After independence in 1960, the city was made the center of the official Beledweyne District. On May 7, 2012, Beledweyne held its first mayoral elections since the start of the civil war in the early 1990s. 200 delegates took part in the contest, which was overseen by the Hiran region's head of elections, Sadaq Omar Sabriye. Mohamed Hassan Nuriye emerged as the new city mayor, obtaining 135 votes versus 11 and 8 votes, respectively, for the two nearest competitors. In his first day in office, Mayor Nuriye officially banned firearms within the city limits. He also warned that people found contravening the edict would have their weapons impounded and could face imprisonment. In addition, Nuriye indicated that for security reasons, government soldiers who were not on patrol should remain within their bases. Soldiers would likewise only be permitted to carry weapons in the city while conducting security operations. To further tighten up on security, the Beledweyne Municipality over a three-day period started simultaneously registering all local residents. Mayor Nuriye also unveiled plans for a citywide beautification campaign. In July 2012, his administration imposed a two-day night-time curfew in Beledweyne, while government soldiers demolished structures that had been illegally erected along the area's main road in one of the Municipality's first urban renewal initiatives. In March 2015, the Beledweyne municipality launched a civilian tax collection program in the city. The tax revenue is earmarked for essential public social services. Additionally, the city government is slated to register all local businesses, which will further facilitate tax gathering. The municipal authorities are also scheduled to set up a new citywide house numbering system. Beledweyne has a population of around 1.7 million inhabitants. The broader beledweyne district has total population of 2 million residents. The city is predominantly inhabited by the Hawiye sub-clan Which is Hawadle and it’s also where the Hawadle leader[UGAAS] lives. Beledweyne is served by the Beledweyne Airport. As of February 2015, the Djibouti Defense Forces have refurbished the airstrip. Beledweyne has a hot desert climate (Köppen climate classification BWh). Between March and April, the average daily maximum temperature in the city is 36.7 °C. In January and February, the average daily minimum temperature is 21.8 °C. ^ "Somalia - City & Town Population". Tageo. Retrieved 27 September 2013. ^ "Ethiopian troops capture Beledweyne from Somalia militants". BBC News. December 31, 2011. Retrieved 2011-12-31. ^ "SOMALIA: Curfew begins in Beledweyn town a day after deadly suicide explosion". Raxanreeb. 20 October 2013. Archived from the original on 2013-10-22. Retrieved 22 October 2013. ^ "Beledweyne finally gets elected mayor". Bar-Kulan. Retrieved 1 July 2012. ^ a b c "Newly appointed Beledweyne mayor bans firearms in the city". Bar-Kulan. Retrieved 1 July 2012. ^ "Nighttime curfew imposed on Beledweyne". Bar-kulan. Retrieved 31 July 2012. ^ "Residents of Baladweyne Told To Pay Taxes". Goobjoog. 16 March 2015. Retrieved 16 March 2015. ^ "Chief of the Djibouti Defence Forces Major General Zakaria Sheikh arrives Beledweyn, Hiran". Goobjoog. 19 February 2015. Retrieved 19 February 2015. ^ "Klimatafel von Beled Weyne (Belet Uen) / Somalia" (PDF). Baseline climate means (1961-1990) from stations all over the world (in German). Deutscher Wetterdienst. Retrieved 22 October 2016. ^ "Long term mean monthly sunshine fraction in Somalia". Food and Agriculture Organization. Archived from the original on 2016-10-05. Retrieved 4 November 2016.